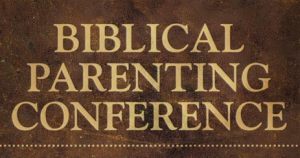 The Resurgence website are providing free audio and video of the Biblical Parenting Conference that was presented by Tedd Trip. Tedd Trip is well known for being the author of ‘Shepherding a Child’s Heart’, ‘Instructing a Child’s Heart’ and ‘Shepherding a Child’s Heart: Parent’s Handbook’ so is well placed to run this series of talks. It can be easy to get stuck in routines with our children, so this is a great opportunity to remind ourselves of how to bring them up in a Christian home. Everyone wants to be a great parent—the biggest responsibility of parenthood is teaching your children to love Jesus with all of their heart, soul, and strength. For parents with children of any age, Dr. Tripp’s insightful, biblical teaching provides perspectives and procedures for shepherding your child’s heart into the paths of life.